A Funny Thing Happened On The Way To The Script Conference (or Whatever Happened To Rip Van Winkle). Graham P. Willams. Five pages. A 'behind the scenes' overview of the production of season four. Mrs Gale, You're Needed. Dan Recchia. Five pages. The Cathy Gale era as seen on US TV in the early 1990s. Whose Face Beneath The Bowler? Michael Richardson. Three pages. 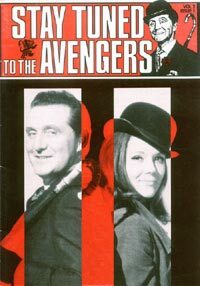 Ruminations on who should play Steed in the much mooted Avengers movie. It's So Nice To See You... Again. Dave Rogers. Ten and a half pages. Linda Thorson Q&A session from Visions 90 TV Convention (Part Two). Will They? Won't They?. Dave Rogers. One and a half pages. Ruminations on when Channel Four would show a mooted thirteen episode run of Cathy Gale episodes.